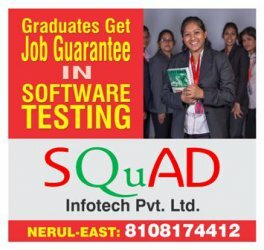 Enter into the Lucrative IT career in Software Testing, an intensive professional level training program by SQUAD Infotech Pvt. Ltd. and get 100% Guaranteed Job in IT. We provide Best Training and Best Placement in Software Testing. Software Testing Course: This is a short-term Professional Course, with highest probability of getting placed in IT companies. Software Testing is easy & excellent way to enter in to IT in which he/she gets good Salary and tremendous growth without being an expert in programming. Placement Zone: SQUAD is working on almost more than 1000+ companies. After the completion of your Professional Training, we offer placements in IT companies only. SQUAD Infotech Pvt. Ltd. is Mumbai’s first dedicated Professional Training Center with a thrust on long-term career and high-end programmers in Software Testing. SQUAD has a significant business presence in IT segment where it offers Total Learning & Placement Solutions to Retails and Corporates. is there to help you out in your struggle and efforts in getting an entry into IT world. Join for Software Testing- the easiest way to make your career in IT. SQUAD Infotech Pvt. Ltd. is Mumbai’s first dedicated Professional Training Center with a thrust on long-term career and high-end short-term programmes in Software Testing. SQUAD has a significant business presence in IT segment where it offers Total Learning & Placement Solutions to Retails and Corporates. Get an exposure to REAL project testing. Weekend sessions for working professionals. 100% Job Assistance until you get placed. Technical & HR Interview Preparation. Free Demo Lecture available prior to the commencement of new batch. Session for Personality Development and Communication Skill. Placement will start in 2 month while training. 5. Free SQL, JAVA and Selenium workshops. software testing classes in Navi Mumbai / software testing classes in Mumbai / Professional training / computer training).